Crampton beat his teammate (and Connie’s son) Doug Kalitta in round 1, Mike Salinas in 2, and Antron Brown in 3. Qualifying for the class was a total shitshow, with car after car failing to get down the track round after round. After resetting the Gainesville Raceway speed record earlier in the weekend and running low E.T. of the first qualifying session, defending event champion Tony Schumacher looked prime for a repeat. After qualifying third, 2013 NHRA Gatornationals Top Fuel event champion Antron Brown faced rookie Audrey Worm in round one. Brown, the 2017 Gatornationals runner-up, had the advantage at the step. The car smoked the tires early into the run, and Brown pedaled it down the Gainesville Raceway stretch to pick up an ugly round win over Worm who encountered problems right at the hit. “It was tricky out here,” noted Brown. “The track got hot. It just kept getting worse and worse during the day. We were trying to keep up with it and we were getting close. We made a good lap in the second round and then we backed it off for the third round. We just didn’t back it off enough. With that being said, we’re going rounds and we’re picking things off one at a time. We just need to keep improving. Top Fuel world champion Brittany Force made her best run since her dramatic wreck at the season opening NHRA Winternationals. Unfortunately, it wasn’t enough to get the first-round win against Tony Schumacher. Force’s 3.742 pass at 325.53 in her Monster Energy dragster was bettered by Schumacher’s 3.717 at 329.26. Despite not winning against Schumacher, Force’s time would have won six of the seven other first round races. 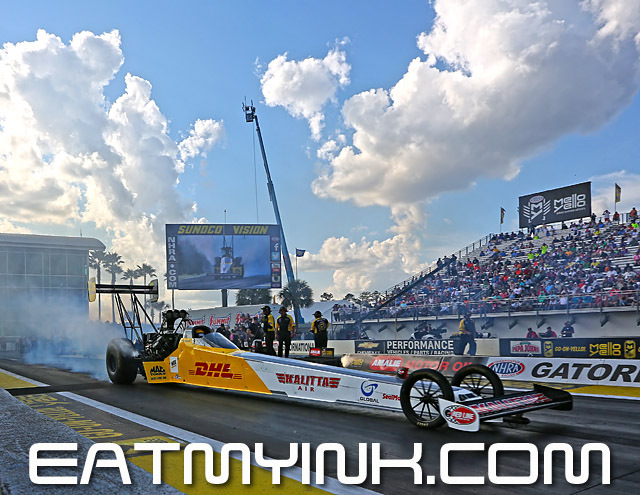 Leah Pritchett clocked a 3.735-second at 321.50-mph pass in the Papa John’s/FireAde Top Fuel dragster to knock out Terry Haddock in the opening round of eliminations. She showcased her quick reflexes with a .053 reaction time at the starting tree, the quickest light of the round. “We are still making progress,” said Pritchett. “I feel like we have our gremlins out of the way. Our hot rod is back and it showed it on the track today. I take the blame for losing to my U.S. Army teammate Antron Brown. He came out stronger. It’s extremely frustrating. I missed it. I’ve been on it all weekend in both cars and missed it when it counted most. We win together as a team and it feels great. The highs are high and the lows are low. Having to sit on that for two weeks waiting for Las Vegas isn’t going to be fun, but we get to switch gears and put ourselves in the Four-Wide mindset. This has been an exciting, very high-paced weekend in Gainesville. I’m disappointed it ended early, and on my shoulders, but we’ll bounce back. FINAL — Crampton, 3.854, 314.90 def. Reed, Broke.